Living rooms are for living — and that means family and kids and pets and friends and fun. That also means you need a floor that is beautiful and reflects your personal style. Hard surface flooring has taken over as the first choice for living rooms and it's easy to see why - better finishes, better surface treatments, better choices - and of course changing interior design trends. While wood looks definitely dominate here, notice I said wood looks. That’s because so many hard surface floors today, whether it's luxury vinyl, laminate, or even ceramic tile, emulate the look of real hardwood. Still, real hardwood does have a way of standing out and may be the reason that it remains a leading choice for signature rooms in the home like living rooms. 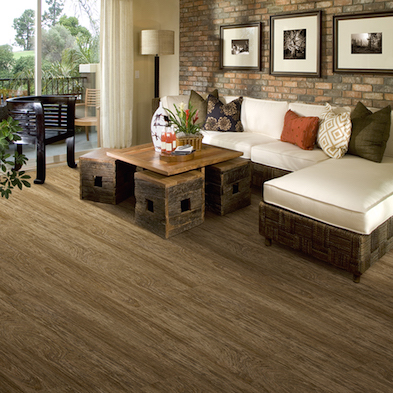 Hardwood, along with bamboo, has it's own style, look and feel. When it comes to style, hardwood in general has upped its game. No longer limited to traditional browns and light colored naturals, wood now feautres color, washes, texture, even patterned looks that have transformed the category into a real design leader. Plus, board length and width have expanded, giving you not only more but better design options. 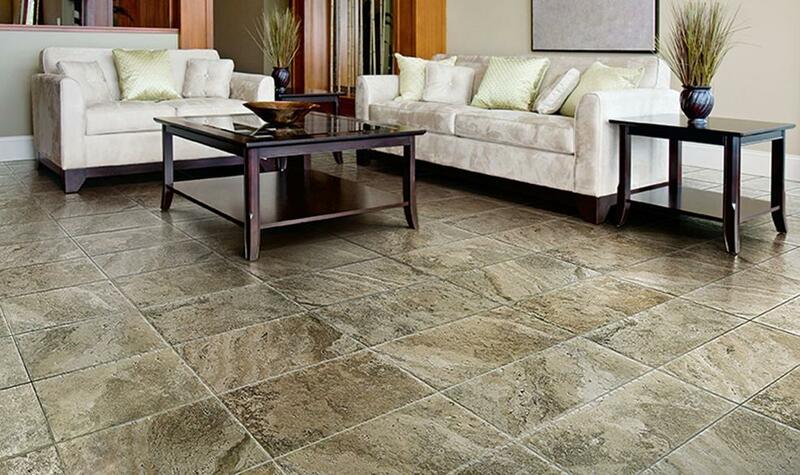 Granted, a traditional ceramic tile floor in the living room might look a little out of place in say, Minnesota, but then again, in Florida or Arizona a tile floor seems only natural. With so much to choose from in terms of style and design, ceramic tile is no longer limited to kitchens, sunrooms and patios. You can have stone looks, wood looks, well, just about anything you want. Don’t be afraid to get creative and your ceramic floor will reward you with unparalleled visuals and unlimited design possibilities that are sure to impress. 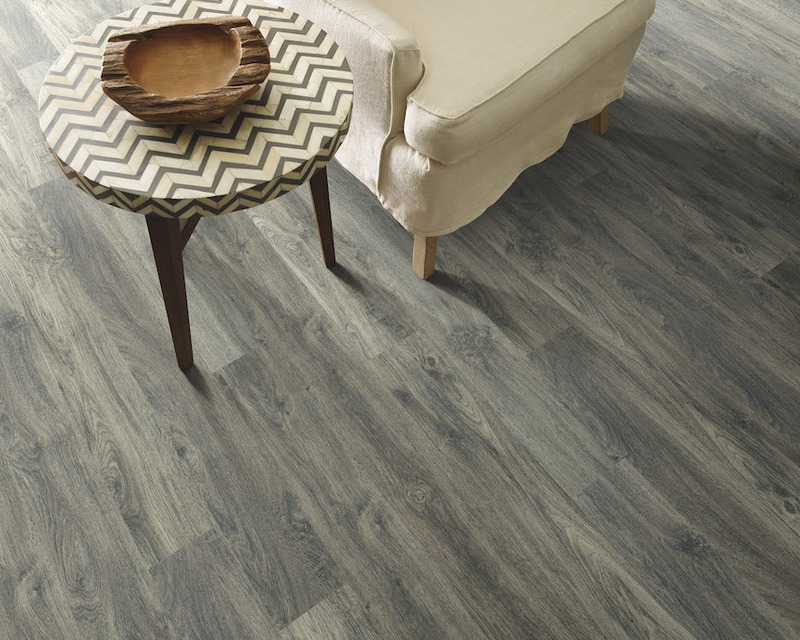 Laminate has caught on as a living room floor due to its combination of great visuals and outstanding performance at a lower cost than most other hard surface flooring products. The only drawback I see to using lamainte in living rooms has to do with that “hollow” sound laminate is known for. This can easily be mitigated with the use of an underlayment or attached backing. Cork, even though it is a wood product, falls into the laminate flooring category because of the way it's constructed on a high-density fiberboard core. Most quality cork floors come with attached backing and cork does not have the same problems with sound as laminate floors. 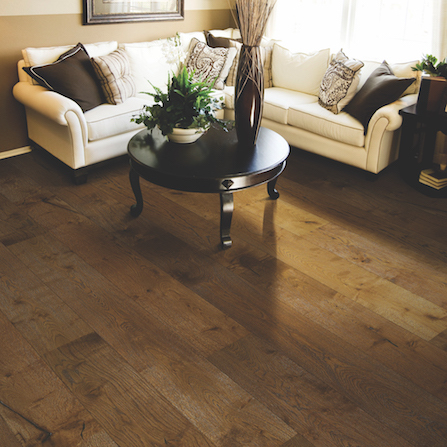 WPC in particular is the vinyl floor most suited for living rooms because it offers the best visuals in vinyl. It’s also a workhorse and is highly recommended for very active spaces. My only reservation about this category is: Do you really want to tell people that your Beautiful living room floor is vinyl? When it comes to performance – especially for high traffic spaces – WPC is a real winner. Once the leading flooring choice for living rooms, carpet has fallen out of favor in recent years. 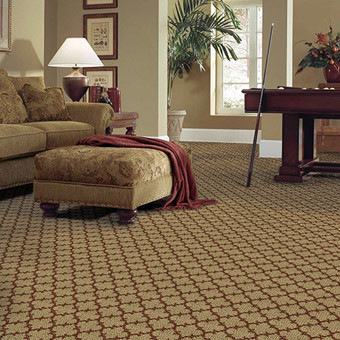 Nevertheless, texture and pattern and more stylish colors are making carpet a better choice than it’s ever been. For comfort underfoot, sound and thermal insulation, fall and slip protection and more, carpet is still king. The most significant trend in carpet is moving to upmarket, better quality goods. There was a time when you’d carpet the entire house; now that carpet is limited to one room at a time, people are spending more for higher quality. Needless to say, these high-end looks are often stunning and let you bring color and pattern to the space in a way that no other flooring offers. New soft fibers and pet protection are further helping carpet stay in the game. Since hard surface floors – especially hardwood – are often paired with area rugs, you might want to consider adding one when you’re out shopping for a new floor. An area rug also is an affordable way to change the look of the room whenever you want.